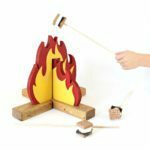 Back again with another Handbuilt Holiday gift plan and today it’s a fun kids play grill you can build from wood. Ana White and I are here every Friday to bring you a new gift build with free plans. 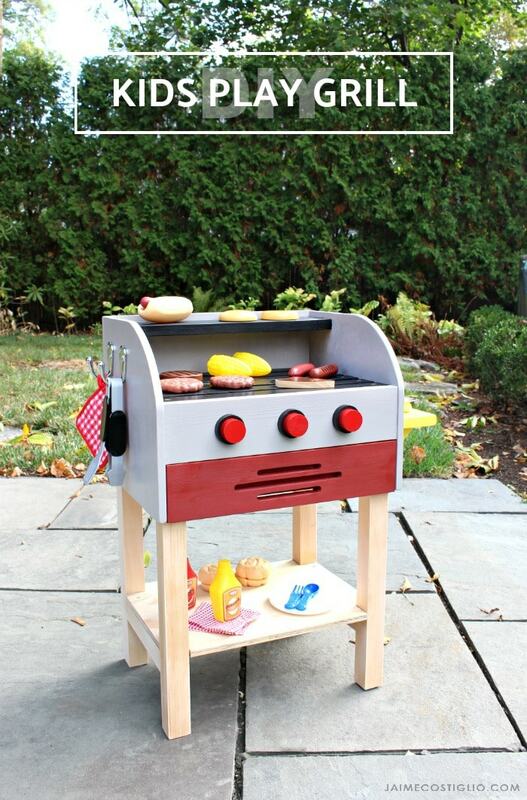 I absolutely love building all the gift projects and this kids grill was so much fun. 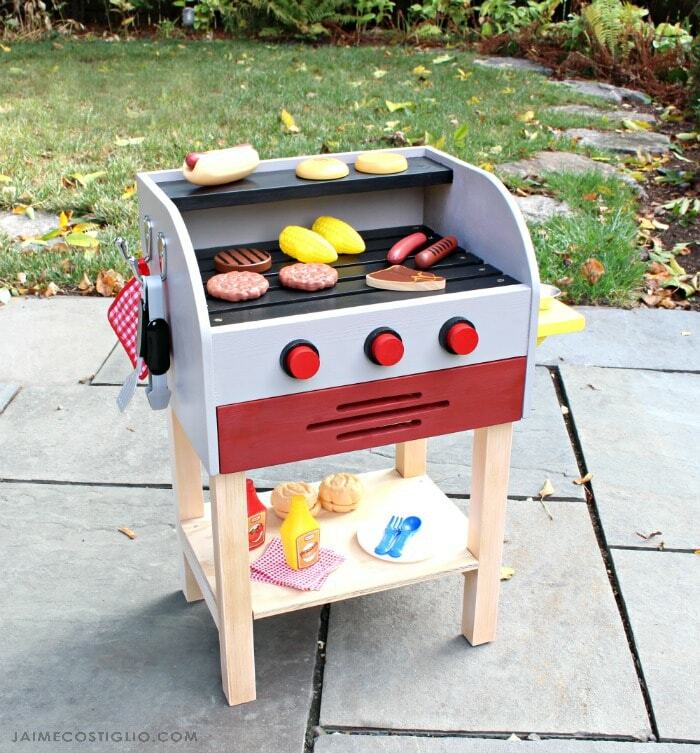 There’s a bonus – this grill works indoors for year round fun! 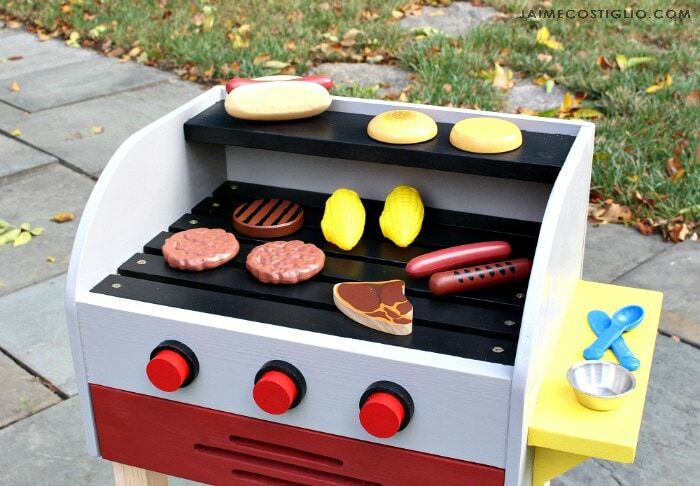 Ana designed the plans for this kids play grill, it’s simple and has just the right amount of details to make it kid friendly and super cute. A warming / toasting ledge plus a generous shelf below and a side ledge for prep items, Ana thought of it all! 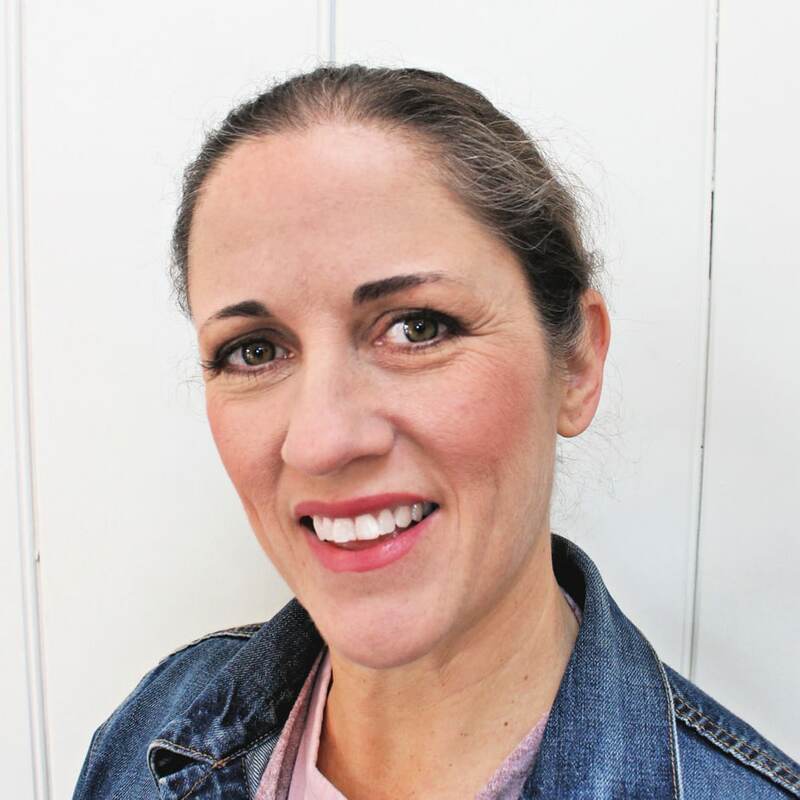 Click on over to Ana’s site here for the complete plans. 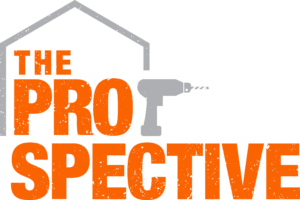 Be sure to read down below for actual process photos before you get started. 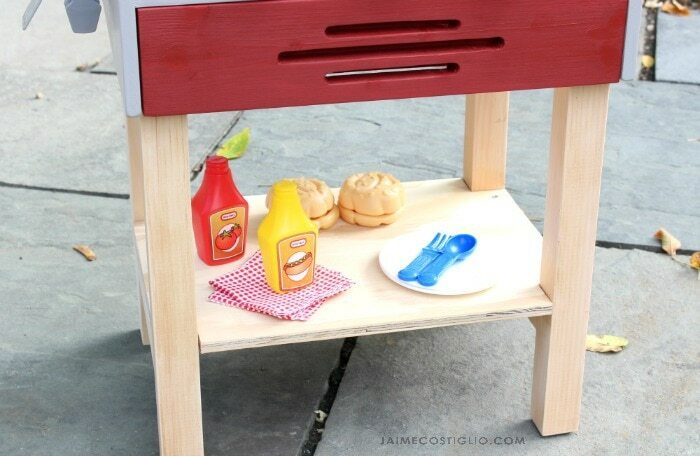 Use a scrap piece of 1/2″ plywood as your spacer when attaching the grill boards. I highly suggest painting the grill boards before attaching and I used Spax construction screws keeping the screw head visible as part of the grill design. Tape off portions before you begin painting. 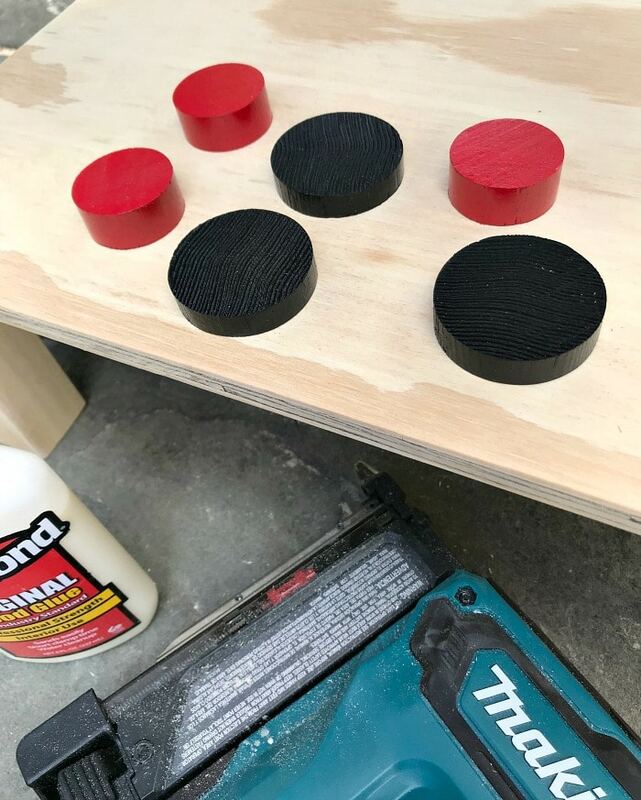 Cut knobs from wood dowels and spray paint. 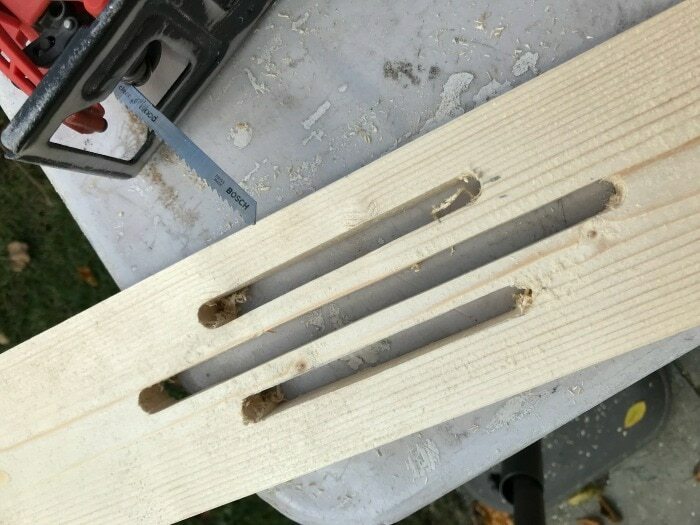 Attach using wood glue and finish nails. 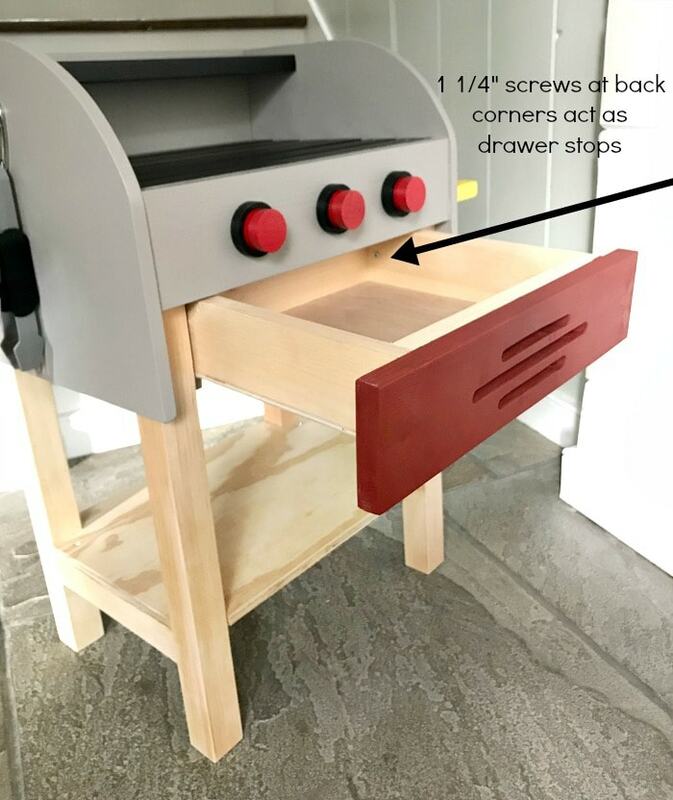 I opted to make the lower 1×4 apron into a drawer to make use of the space below the grill boards. 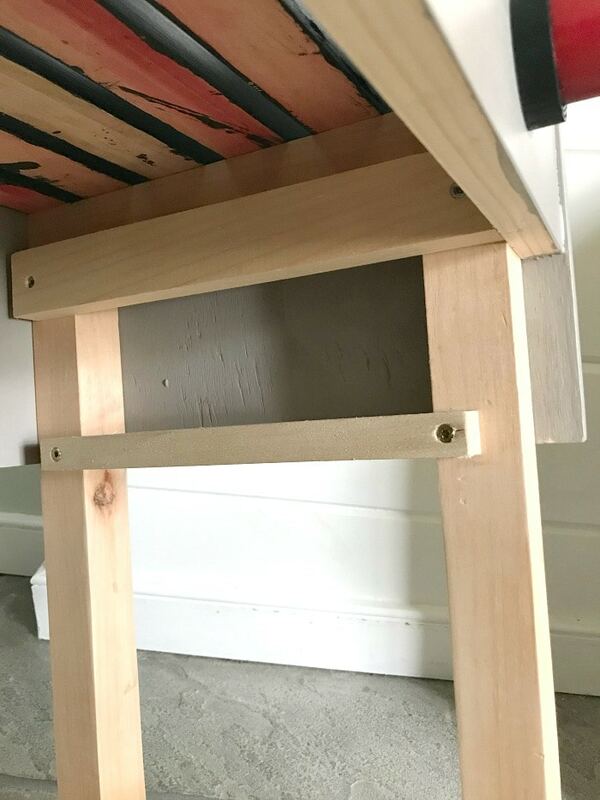 I used a 3/4″ square dowel on each side as a drawer glide and a scrap 1×2 as the upper drawer glide. 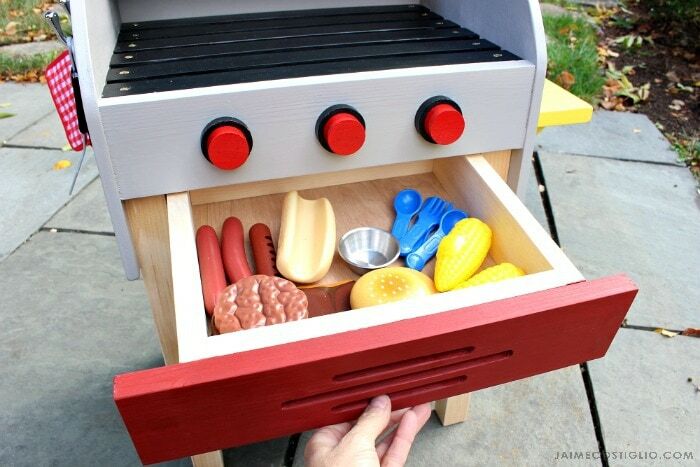 To make the drawer front look like a grill vent mark the lines and use a 3/8″ forstner bit at each end. Then complete the vented portion using a jigsaw. 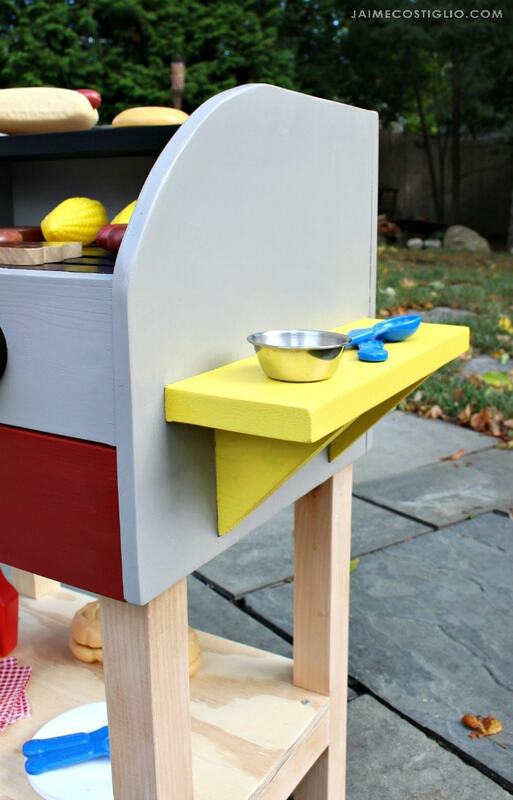 The drawer box is 1×3’s with a 1/4″ plywood base. 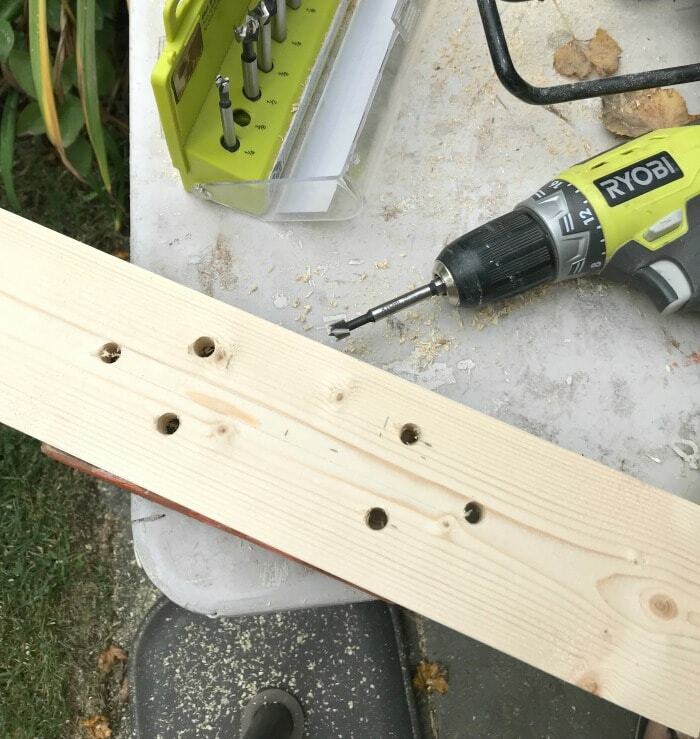 Paint the drawer front first and once dry then attach to the box using wood glue and 1 1/4″ countersunk wood screws from the interior. 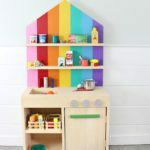 Additionally, after the drawer is installed, add screw stoppers near the back sides of the drawer to prevent it from falling out onto kids toes. 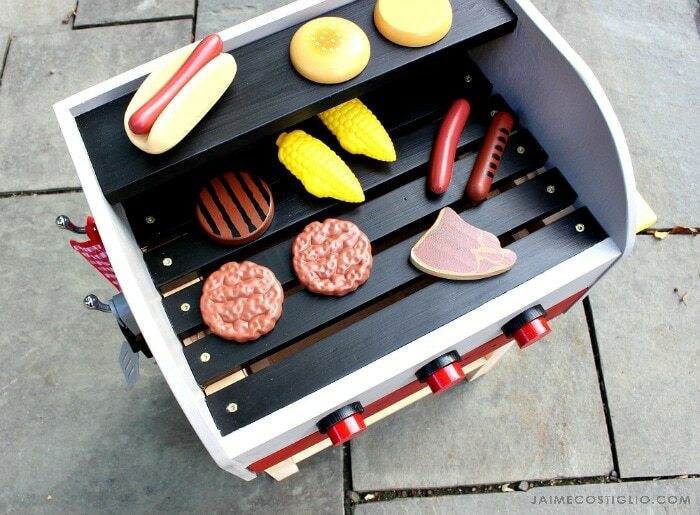 Fill up with all the kids play grill accessories and use for storage. 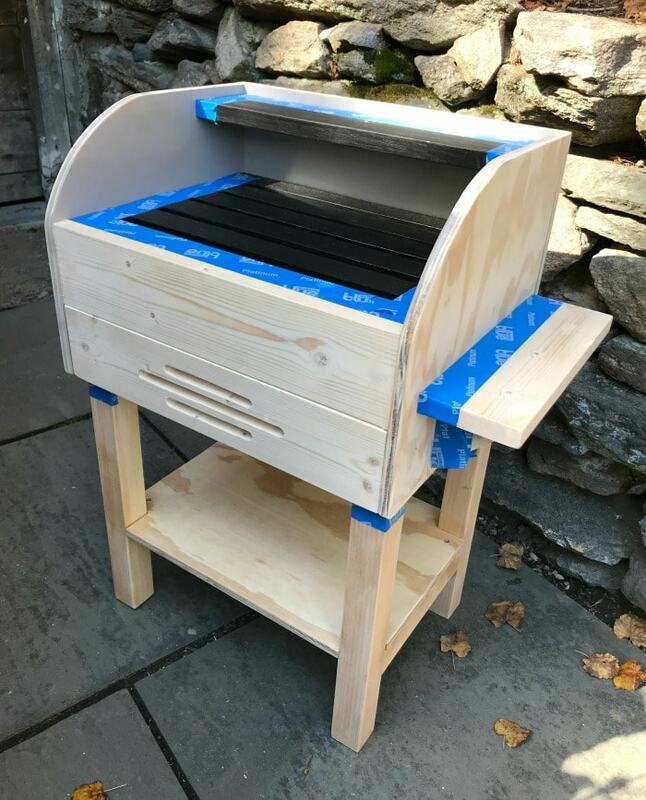 I hope you enjoyed this week’s Handbuilt Holiday gift build. 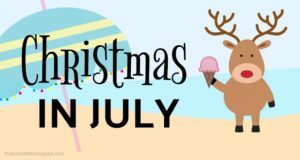 Please stop by next Friday when we share another fun gift plan to add to your project list. 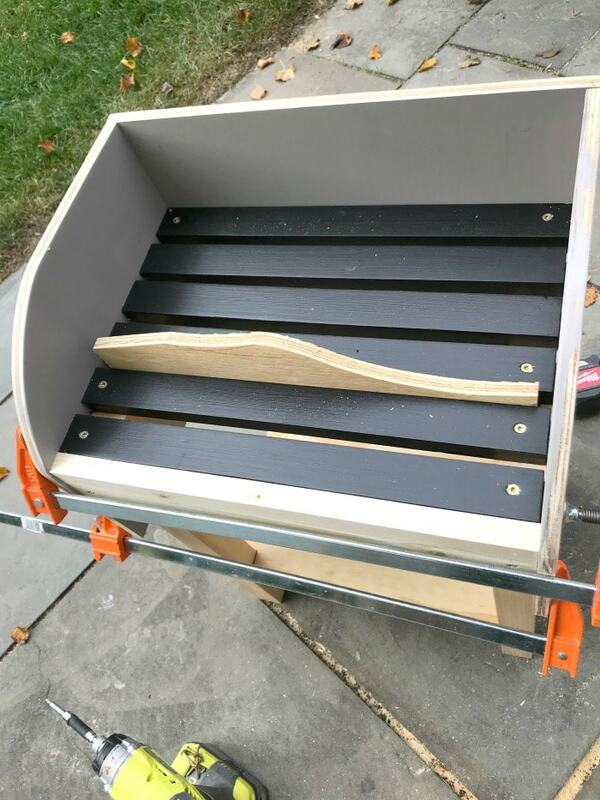 Thanks Wayne, it’s definitely a fun project to build and super sturdy too. I wish my kids were still young enough to play! Thank you! 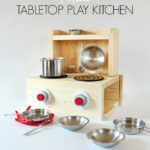 Ana and I love putting it together and building all the fun things bring so much joy. 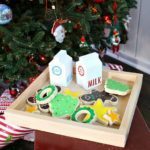 I hope others find something to build for their family and friends for the holidays. Up to how old do you think a kid would be for this? 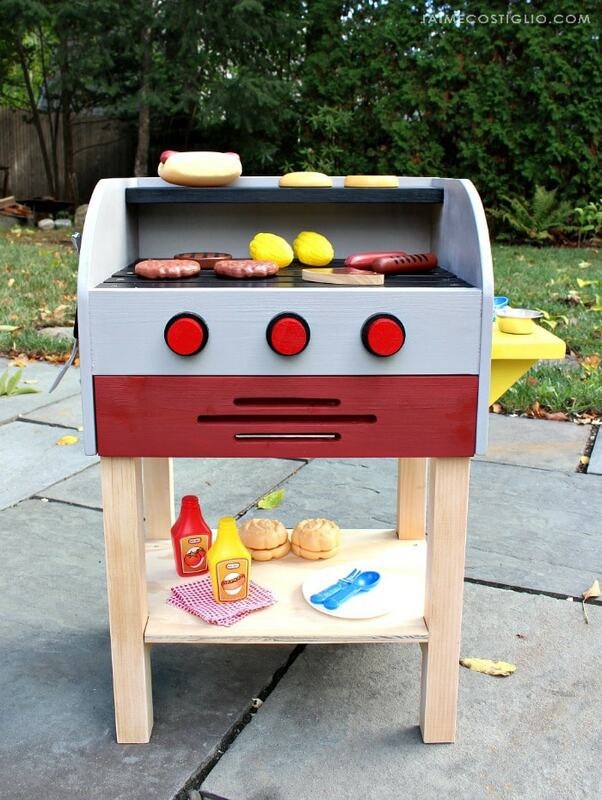 This kids play grill is probably best for ages 2 – 6.